Print c/o Kayla Weber Art. We’ve all failed at New Year’s resolutions at one time or another (or repeatedly.haha). The first step is to wipe the slate clean for this year and let go of any guilt you may be feeling about your inability to stick with your original goal. Forget the failure and move on. 2. Reset your goals into goals that are attainable. Sometimes we set ourselves up for failure by making pie-in-the-sky goals. 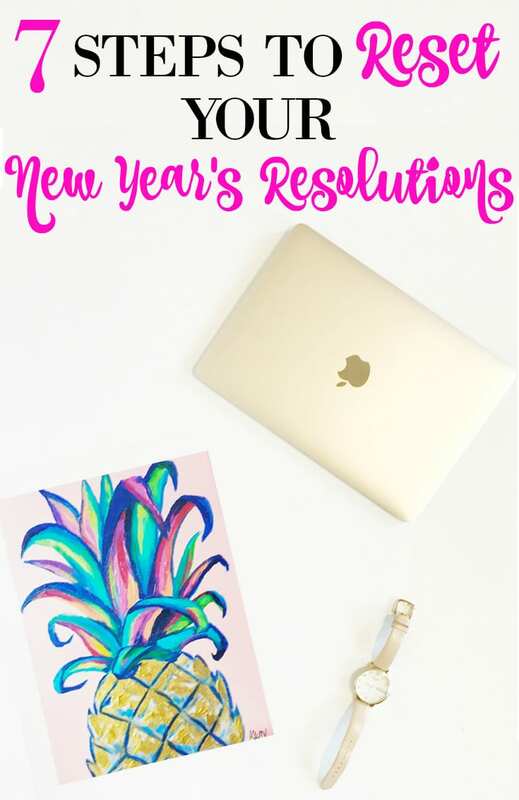 While I think we should all pursue our dreams, it can become discouraging when we make a resolution that just isn’t attainable in the next year. It’s so easy to lose sight otherwise. By making attainable goals, you set yourself up for SUCCESS! Reset your original resolution into something that is realistically attainable by the end of the year. That doesn’t mean you have to forget your dream–you’re just making a plan to get there! 3. Make sure your goals are measurable. As a business major, I learned that when setting goals for companies, those goals should be measurable. Otherwise, how will you know that you’ve reached your goal? Instead of making vague resolutions, set goals that are specific–> “I want to reach XZY by December 31, 2017.” How can you clarify your resolution into something more measurable? 4. Write down your goals some place where you will see them every day. It’s one thing to make a resolution and set goals in your head. It’s another thing entirely to write them down. By writing down our resolutions and goals, we are giving them power and making them real. Write them down somewhere you can see them every day. This will help you to reaffirm your desire to reach them! 5. Work towards mini goals. Let’s be honest, the end of the year is soooo far away! Look at your goal and see how you can break it down into mini goals–> “I want to reach X by June 30. I want to reach Y by September 30. I want to reach Z by December 31.” By breaking your goal into mini goals that are more short-term, you’re once again setting yourself up for success. Each time you reach a mini goal, you’ll feel a sense of success and be more resolved to reach your overall goal! 6. Have a rewards system. I work better when I’m working towards a reward, and not just the goal itself. Decide what you’re going to reward yourself with each time you hit a mini goal and then when you hit your big goal! Make your rewards something that you really want, and don’t reward yourself with it until you’ve hit your goal. When you’re working towards goals that aren’t easy, sometimes it’s so easy to get off track. This is especially true when you don’t have anyone to answer to but yourself. Find a friend that has similar goals and hold each other accountable for reaching them! Check in with each other and encourage each other. You will keep each other on track! What were your New Year’s resolutions/goals? Do you need a reset?